What says summer more than a couple of kids sitting outside at a lemonade stand? The refreshing taste of the lemonade paired with the adorable entrepreneurs makes for a classic American summer memory that everyone can recall. 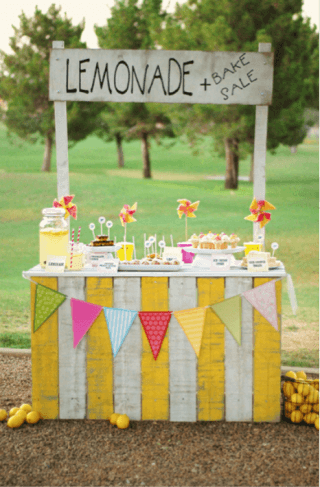 Why not take the lemonade stand up a notch from old plastic wagons and card tables, and make this super cute stand for your kids? It’s a project the whole family can be involved with and is sure to recreate those idyllic childhood memories. Here is a great recipe for some old fashioned lemonade to sell at your stand! Be sure to keep plenty of ice and cups handy, because once people get a taste of this refreshing drink, they’re sure to come back for more! It makes about eight cups, so increase the recipe accordingly for how big you want your batch. 1. Juice eleven of the lemons – they should yield about 3 cups of lemon juice. Pour the juice into a large pitcher through a strainer to get rid of any seeds and pulp. 2. Slice the remaining lemon into slices and remove any seeds. Set aside. 3. Stir 1-1/2 cups of sugar into the lemon juice until it fully dissolves. Add the water and stir to combine. Adjust the sugar and water to taste if necessary. 4. Empty a tray of ice cubes into the pitcher and add the lemon slices.